Forget crunches and take a look at these New Rules for Lifting Abs. Great ideas for developing core strength. Can you hold the plank position for 2 minutes? 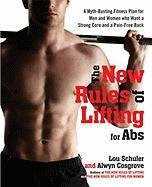 I'm ordering New Rules for Lifting Abs!